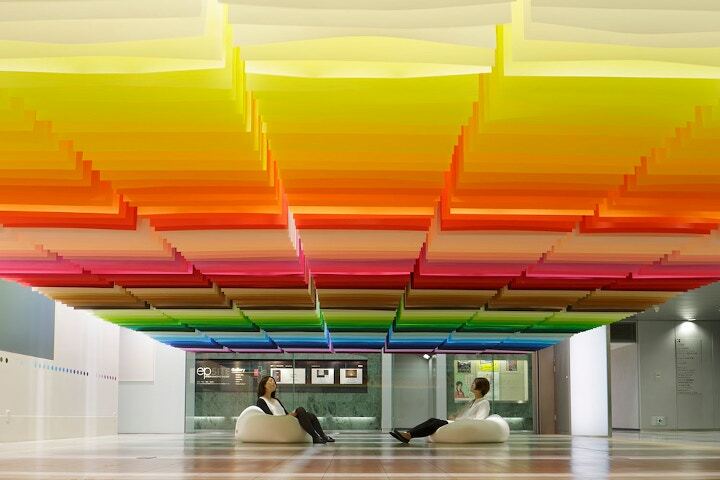 Emmanuelle Moureaux is a French architect and designer based in Tokyo. Winner of the '15th CS Design Award - Special Jury Prize' in 2008, she uses colours as objects to divide space. Moureaux exhibited her piece, '100 Colors' at the Shinjuki Creators Festa 2013 and the title indicates the number of hues she used when she hung 840 sheets of paper from the ceiling. When I first arrived in Tokyo, I was fully fascinated by the colors overflowing on the street. In that very moment, my mind decided to move to Japan. The overwhelming number of store signs, flying electrical cables, and flashes of blue sky framed by various volumes of buildings, created three dimensional “layers” in the city. The flood of various colors pervaded the street built up a complex depth and intensity in the space. These indelible experiences of colors and layers in Tokyo were the inspiration and essence of my design concept of “shikiri”, which means dividing (creating) space with colors. Valuing the emotion inspired from Tokyo, in the 10th anniversary year of my studio, I wanted to show the beauty of colors to the fullest extent. I also wish to share the feeling of being surrounded by overflowing colors by exhibiting 100 colors, here in the middle of Tokyo. 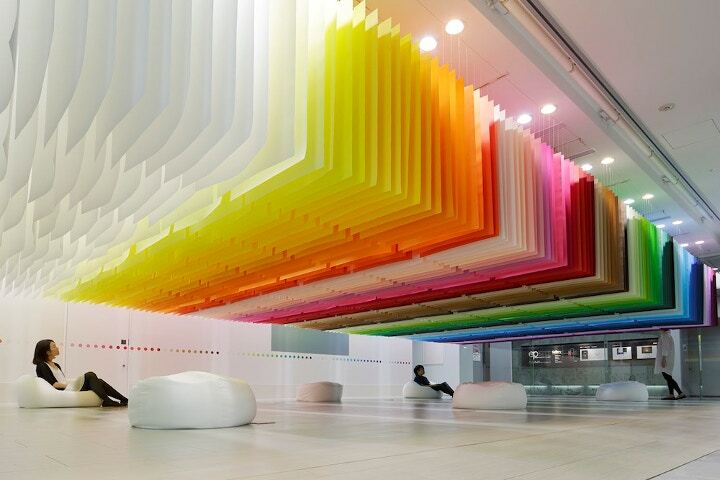 I selected 100 colors from the Japanese paper manufacturer, Takeo and used 840 papers sheets hung from the ceiling creating a volume of color floating in the air. Underneath the colored papers, bean bags are placed to encourage visitors to take a seat and experience another view. On the rear wall, 100 colors of round circles are lined up for visitors to participate. The visitors are questioned, “Which is your favorite color today?”, and asked to place a small round sticker around their favorite color. Throughout the exhibition, the rear wall will transform into another piece of artwork, showing trend of colors chosen by the visitors. 2. Where did you grow up and how has it influenced you? I discovered Japan through books. I love reading and read a lot of Japanese literature when I was studying architecture in France. Fascinated by the culture, I decided to learn more about Japanese cities, especially Tokyo, and Japanese culture. As a research theme for my architectural diploma, I chose the theme “a multifunction building in Tokyo”. For this opportunity, I visited Tokyo for the first time, in 1995. I stayed only one week but this trip was a turning point for me. I was very impressed by 2 points: The city brimming with colors, and the layers of the city. To my eyes that grew up in a town made of stone, Tokyo’s colors appeared beautifully like a painting. I decided to live here. I went back to France, got the French architectural license, and 2 months after, in 1996, moved to Japan. "Color" is the concept of all my works. With colors, I design new concepts, new atmospheres which will give emotions to people. I use colors in order to give emotions. I use colors as three-dimensional elements, like layers, in order to create spaces, not as a finishing touch applied to surfaces. These two elements (colors and layers), inspired by Tokyo, are the basis of my design. Tokyo inspired and inspires me a lot. Tokyo is very colorful, contrary to the grey monotonous European cities, built in stones. The buildings themselves are not colored, but a lot of non-architectural elements like vending machines or signboards give colors to Japanese cities. Although, the recent buildings or interiors are monotonous: white, black or grey are very fashionable colors in Japan. I want my designs to inspire people to feel emotion as I felt when I saw the beautiful colors of Tokyo. I work now on a lot of projects at different scales, architecture, interior design, installation, product, art direction too. 4. Everyone is shopping paper this week at Cass Art - what would be your top 5 picks of our paper products on our website and why? I love notebooks and collect them so I selected from the Fabriano Bouquet pads because I like this set of 7 colors as a rainbow. I use Moleskine notebooks and I love this white series. White is the most important color for me in order to design with colors. This is the launch exhibition of the ‘100 colors’ series, which Emmanuelle plans to expand in different cities around the world. You can find out more about Emmanuelle Moureaux's upcoming projects through her website.